Devolver Digital didn’t mix it up on the show floor with everyone else, but that didn’t make the indie publisher’s E3 presence any less spectacular. Activision had its booming, multi-screen open theater, 2K Games had a towering Evolve monster, and — directly across the street from the Los Angeles Convention Center — Devolver had a full-blown trailer park BBQ. You haven’t truly experienced a game demo until you’ve seen it behind the closed door of a tin-can trailer. Unfortunately, we didn’t get to sample everything in Devolver’s circled wagon sideshow. We missed out on seeing Hotline Miami 2‘s newly announced level editor, and we didn’t bro out at all with Broforce. We also missed the epic weirdness of Hatoful Boyfriend, a “visual novel/dating sim” set — naturally — in a school attended by talking pigeons. The biggest disappointment, however, was not getting to spend any time with Titan Souls; it’s a lo-fi open world game that draws inspiration from Shadow of the Colossus as it sends players up against a gauntlet of bosses. It’s an evolved version of a Ludum Dare 28 entry, with more bosses and a bigger world. 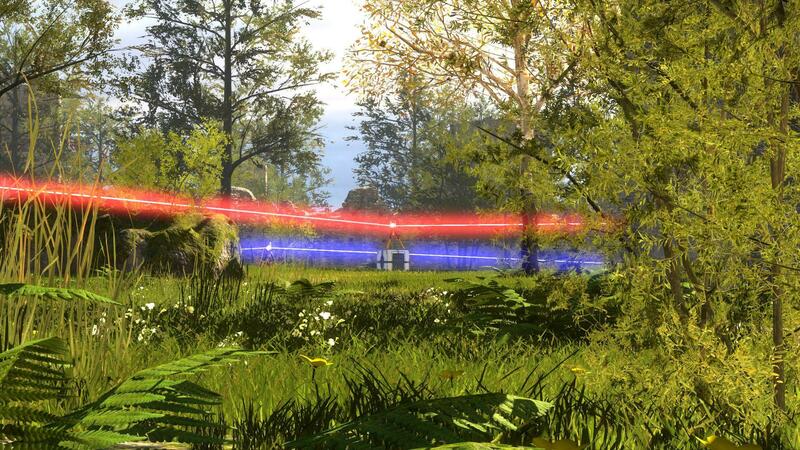 All of these games are worth checking out, but let’s zero in on the two that we did get to spend a meaningful amount of time with: Roll7’s Not A Hero and Croteam’s The Talos Principle. First, some all-important context. Roll7 is the team behind OlliOlli, that inventive skateboarding side-scroller for PlayStation Vita. Not A Hero started life as a procedurally generated dungeon crawler… until Roll7 tossed everything out and turned it into a pixelated cover-based shooter that owes as much to John Woo as it does to BlackThorne. You play as the gun-toting lackey of talking rabbit and mayoral candidate, Bunnylord, The big boss needs your help in securing his bid for public office, and that requires a bit of the old ultra-violence as you shoot your way across the city’s four districts, each controlled by a different enemy faction and broken into multiple levels. You complete a single level by wiping out every baddie that’s waiting to kill you, though completing the set of challenges in each one improves your star rating for that level. It sounds straightforward, and it is. 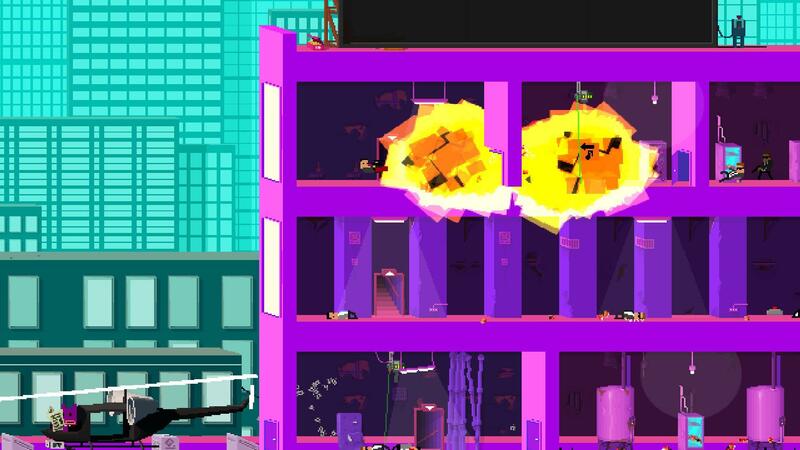 Much like OlliOlli, Not A Hero‘s gameplay is what sets it apart. This is no run-and-gun. If you stroll into a building and just start shooting wildly, you’re not going to last. It’s vital that you use cover — anything from columns to doorways to waist-high obstacles — to avoid enemy fire, peeking out to shoot only when the enemy is exposed. It’s possible to walk freely to the left and right (or up/down stairs by accessing doors and elevators), but it’s much more effective to combat roll from one cover location to the next. That’s the basic flow of gameplay, but Not A Hero isn’t quite as simple as it sounds. A variety of enemies step up to challenge you, from standard grunts with peashooters to beefy shotgunners and stabby chargers. Ammo is limited, so you’re constantly looking for pickups, and reloading is both a time-consuming and a noisy process. Any enemies clued in to your position and on the same floor rush in as soon as you start to reload, so it’s always important to conserve your bullets and advance cautiously. Shooting isn’t the only way to take down Bunnylord’s enemies, however. 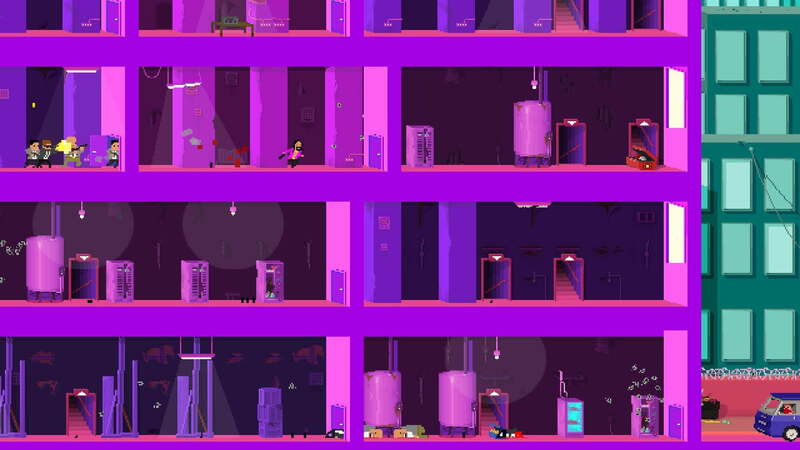 There are lethal pickups scattered throughout each level, ranging from the mundane to the completely bizarre. Proximity mines and remote-detonated explosives are joined by oddball power-ups like the Kitty Kitty Bang Bang, an adorable little cat that walks in one direction until it comes into contact with an enemy… at which point it violently explodes, clearing out a large portion of whichever floor it’s on. More than anything, it’s the smaller flourishes that make Not A Hero really stand out. Bunnylord’s pre-mission text is randomly generated, with verbs, nouns, adjectives, and adverbs plugging into fixed templates, Mad Libs-style. 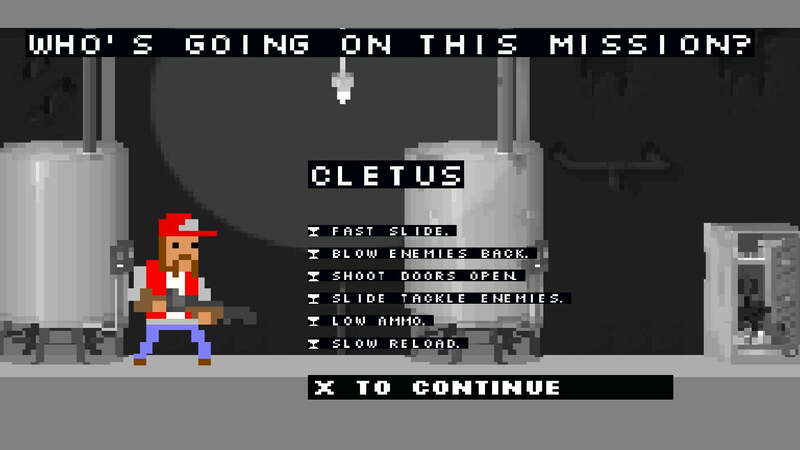 Unlockable characters — earned for completing districts and earning higher star ratings — bring along different weapons, but they’ve also got personality, whether it’s Cletus the redneck with his shotgun or the fast-moving, hip-thrusting Jesus and his machine pistol. Not A Hero isn’t anything like OlliOlli in terms of the experience it delivers, but both games hide unexpected depth behind uncomplicated mechanics. One more like it for Roll7, and we can call it a trend. 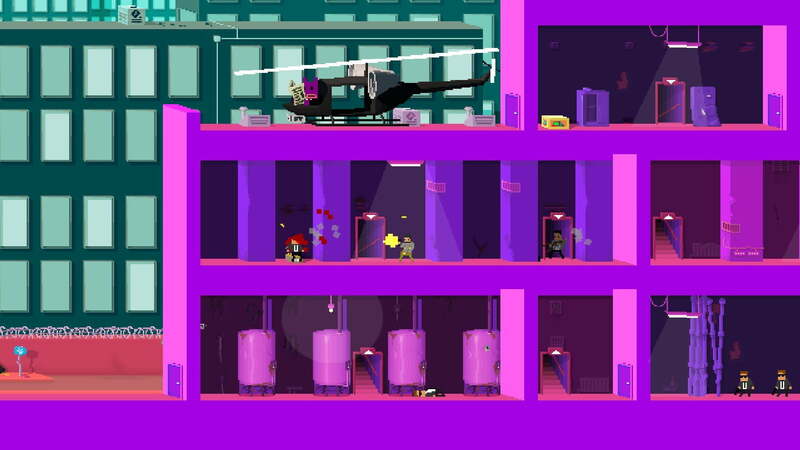 Not A Hero is set to arrive in early 2015 on PC and PlayStation 4/Vita, but it’s not yet known if they’ll be simultaneous launches. It’s true though. 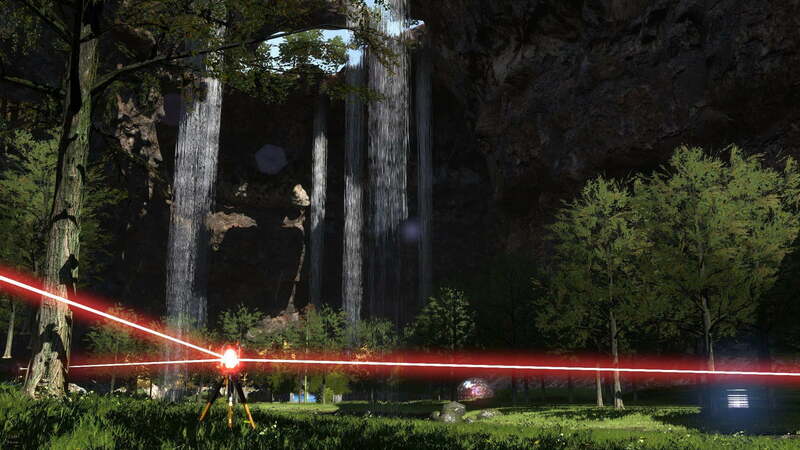 The Talos Principle is exactly what that description makes it out to be. 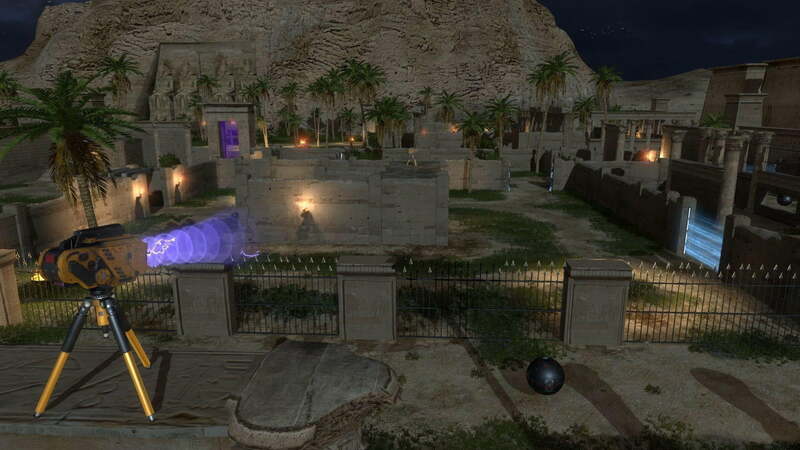 It’s got more in common with Myst than it does with any of Sam “Serious” Stone’s blood-soaked adventures. The game opens with no real preamble or context. You’re a robot dropped into a semi-open world, and as you explore you come across an assortment of puzzle areas. One relatively simple early puzzle involves picking up a little tripod-mounted jammer device and placing it in front of a force field that blocks your progress. The goal of each puzzle is to recover a Tetromino-shaped Sigil; gather enough of these Sigils and you get to move on. 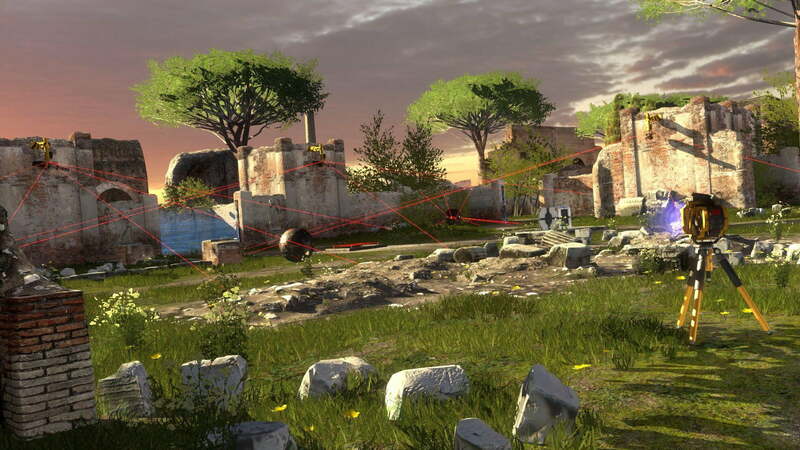 The Talos Principle‘s open world benefits from lush visuals, but Croteam’s approach to controls and user interface is best described as minimalist. There’s no real HUD to speak of, and single-click contextual controls that handle everything from picking up and placing objects to linking together beams of light with the help of tripod-mounted crystal (lots of tripods in this game). The puzzle areas integrate seamlessly into the open world, with just a brief flash of text popping up to let you know the difficulty of the puzzle you’ve just approached. As you solve each challenge, the game rewards you with additional bits of insight into the story. There are also terminals scattered around the spaces between the puzzles, and interacting with these reveals even more. 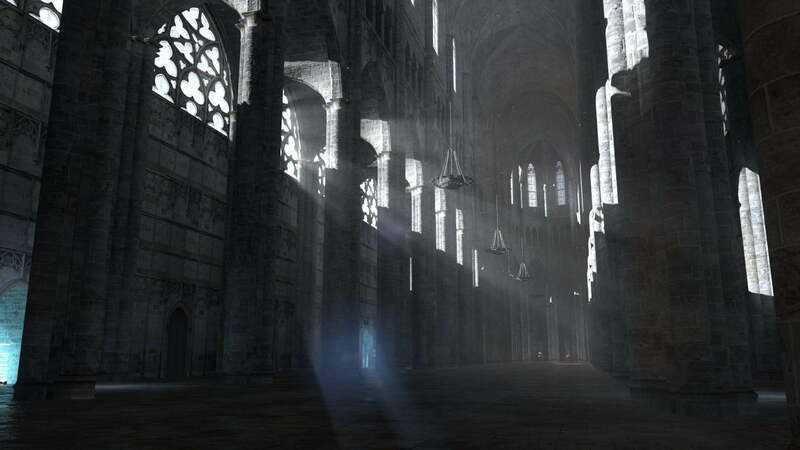 This is where the philosophical component of The Talos Principle come in. The brief slice we got to see in Croteam’s trailer wasn’t enough to really talk about, but it’s worth noting that Croteam’s trademark sense of humor is evident here. An all-text interaction with the AI embedded in one of those aforementioned terminals is immediately reminiscent of Portal‘s GLaDOS at her most mischievous. 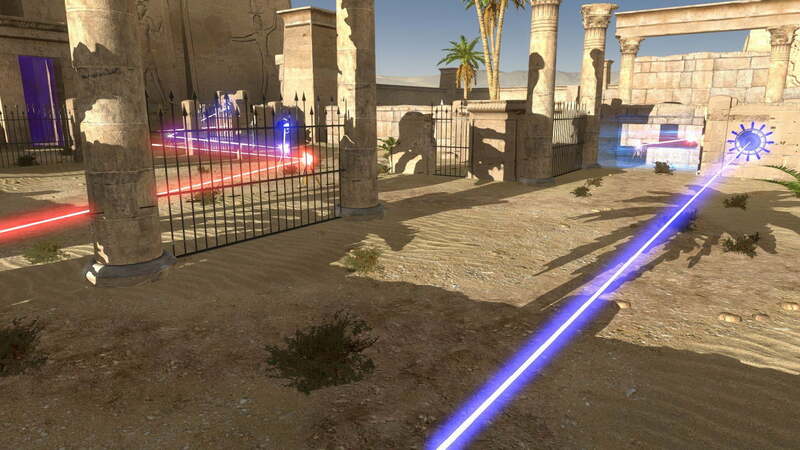 The Talos Principle comes to PC (via Steam) and PlayStation 4/Vita this fall.